Combine the sugar, heavy cream, chocolate, and butter together in a medium heatproof bowl and set the bowl in a wide skillet of barely simmering water. Stir from time to time until the butter and chocolate have melted and the mixture is smooth. Remove the bowl from the skillet and add wine and whisk together. Transfer to a fondue pot with a flame underneath. 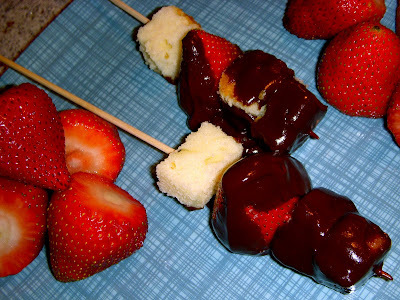 Serve with pound cake cubes, strawberries, and biscotti bits on the side, for dipping. This fondue was a tiny terrific taste of heaven! So smooth, so rich, so chocolaty. There were plenty of "snacks" to dip into this luscious fondue pool, but my two faves had to be the sweet golden pound cake and surprisingly, the light and airy tortilla chips. Don't take me word for it. Try the salty goodness for yourself!